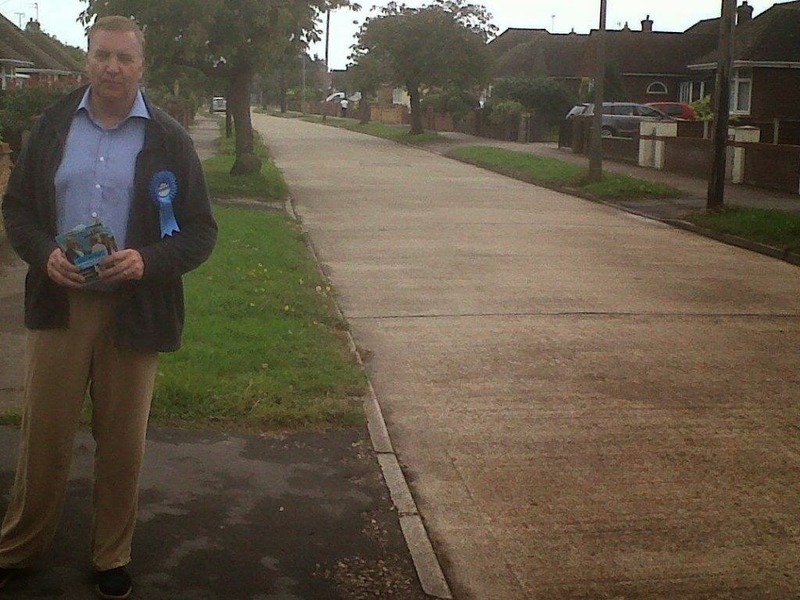 Hello Clacton - Conservatives Calling! 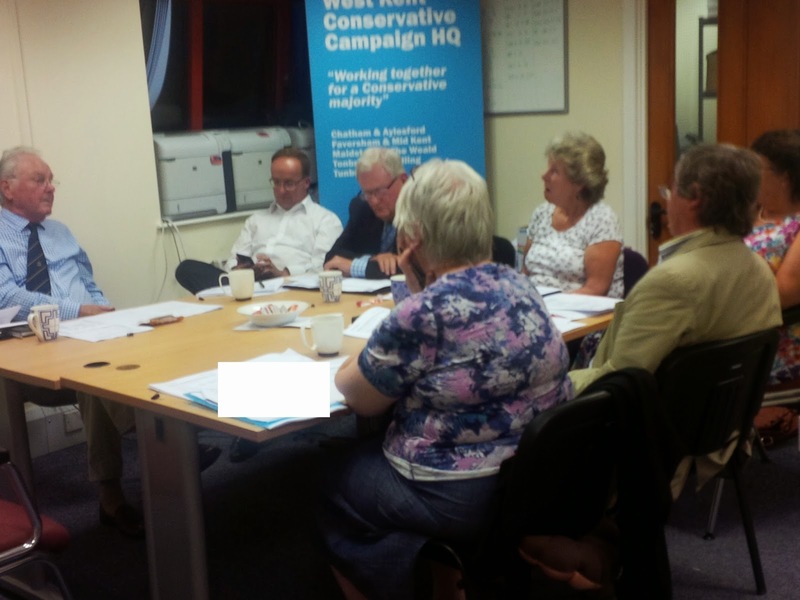 The West Kent Phone Bank will be in full swing tomorrow (Friday) calling residents in Clacton for GOTPV. If you can assist for an hour or two from 11am, call Jon Botten on 01732 842794. I recall a colleague who was in-situ as a constituency agent for many years telling me how he "dusted off" previous year's leaflets, changed the name and date, and printed them again without anyone noticing. This saddened me as it demonstrated how bored he must have been, how the excitement I still have for my job and pride I take in doing it to the best of my ability must have deserted him and, I fear, served as a warning that one day that might be me. Ever since, to avoid the temptation, I have resolutely refused to retain electronic copies of leaflets. I can see how it would happen. It's D-3, candidates and ward organisers are shouting for their GOTV leaflets and you have a dozen other things to do. The ones on file were last used a year ago.... no-one will remember, and if they do remember does it really matter? Suddenly you've crossed the Rubicon and "good enough" becomes your yardstick by whiich you measure your effectivness. Retaining a spark of originality and constantly trying to find new and better ways is what keeps us moving forward, and I am fortunate that I work for Officer teams and Associations who seldom say no. I am sure there are times when they must think "where the hell is this heading" but I suspect my enthusiasm and track record allows me more leeway than many. Sometimes my ideas fall flat, others just "wash their face" and some fly; that is the nature of a random and creative mind. As I travel around the Region and at times further afield I often meet colleagues who are bursting with ideas but are held back by the closed minds around them. During one recent visit I met a councillor from a marginal seat who had downloaded our PV recruitment literature and wanted to run it in his ward, but the Association Chairman wouldn't allow it as "postal votes are liable to fraud". I've met a Treasurer desperate to run the CCHQ Christmas Draw but cannot do so as "we tried it 20 years ago and it failed", I have visited an Association which insists on interviewing new members before allowing them to enroll and I've met three keen activists who wanted to launch a branch in their village but were refused permission as the Association Chairman didn't want a rival power base. It's enough to make you weep. I am all for a debate or a discussion and I positively welcome people challenging my ideas. In fact, I wish there was more interaction as having to discuss, debate and defend a suggestion tests its validity and exposes its weaknesses. There are however a group (albeit thankfully a very small group in our neck of the woods) who default to a negative as soon as any proposed change of different approach is suggested. The have got their opposition down to a fine art; usually using some arcance reference to "not fully discussed" or "we've tried it before" as a tool to stop change. What irritates me most about the people who always say "no" is they never (and I really do mean never) come up with a better idea of their own. Not once have I heard a suggestion from them on how to recruit new LG candidates, or raise new money or enrol new membership. It must be totally disheartening to have original ideas and find yourself surrounded by people why constantly look backwards and resist change. How lucky I am to work with Officer teams and Associations which never stand still and seldom look back. Following our acclaimed "Open Primary" in Tonbridge & Malling which led to the selection of Tom Tugendhat, I am delighted to report the Chatham & Aylesford will be piloting a "postal primary" to select Local Government candidates in a trail ward. I believe this is a national first! All credit to the Association Officers and Management Committee for their vision in agreeing and to the three candidates for their enthusiasm. 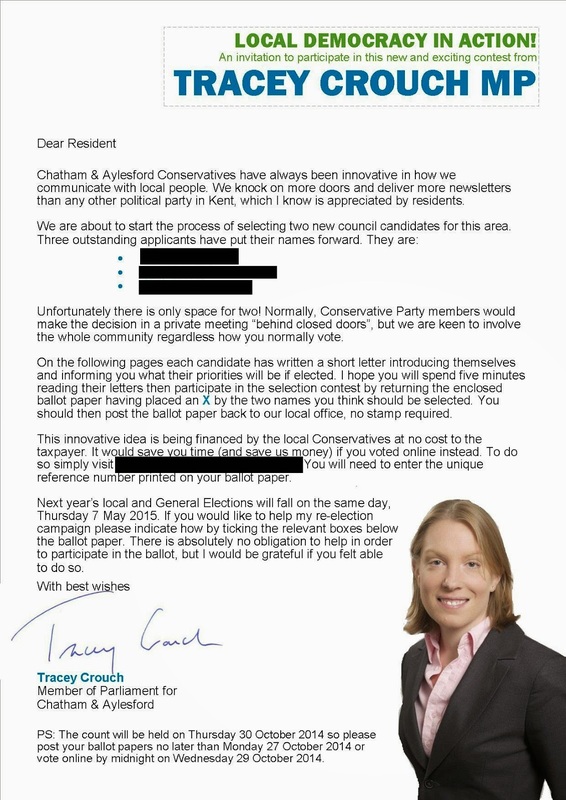 Here is the explanatory covering letter from Tracey Crouch MP which will front the information booklet delivered to every registered voter along with a ballot paper. There will also be the option to vote online, using a unique security code to avoid multiple voting. The cost of the trial are being underwritten by the Association, though we are confident of recouping much of the outlay via voluntary donations. We estimate the final cost will be around the same as a colour newsletter, though this could depend on the level of participation and the number of respondents who helpfully put a stamp ion their envelope! The three applicants are producing their A4 letters / personal statements over the next week and we aim to deliver the voting packs w/c Monday 6 October. PS: A number of you have enquired how this complies with the Mandatory Selection Rules. Allow me to explain. The ward in question does not have an active branch, so responsibility for the selection rests with the Association Executive Council. As with any selection, the Executive ratifies the decision and has the power to appoint candidates. This ballot is therefore to seek the views of the wider community, which will be reported to the Executive which (as always) will make the final decision. The exercise, therefore, is not changing the rules in any way - simply providing the Executive with a greater degree of local information and knowledge which will inform the decision making process. One of our local members has just phoned to say he is unable to attend Party Conference due to a last minute diary clash. He has an option on a double room at the Ibis Budget Hotel in Birmingham City Centre. The hotel is booked for three nights (Sunday / Monday / Tuesday). He booked very early so his rate is £28 per night (or £84 for three nights). He hasn't paid but has a booking reference number. I know many people are looking for accommodation, so email me at westkentconservatives@gmail.com if you are interested and I will put you in touch. I expect a glass of Champagne as a "brokerage fee". First come first served! Some lucky person is going to get a bargain. The hotel is showing no availability, but the same room for the Thursday night is £120 (for one night). Being an uber-nerd I am happy to admit reading a detailed account of the 1987 General Election (690 pages of charts and psephological data from Dennis Kavanagh). Several weeks ago Matthew Parris, a man who writes like an angel and whose politics I have long admired, really made me angry. I have quoted Mr Parris on this blog many times, including his abhorrence of racism, his despair at the negativity of UKIP and how the Conservative Party must not allow itself to be defined by who we are against. His rejection of the tattooed, poor, unwell and badly attired voters of Clacton was therefore not only cruel but also flew in the face of almost everything I hoped and thought Mr Parris believed in. Suddenly here was a man whose principled stance against the anger and intolerance of UKIP turned into a man who was happy to parade his own intolerance against people whose lives, clothing, health and house prices didn't meet those of his Soho House friends or the Dockland supper clubs. It is easy when visiting a town to view it through rose tinted spectacles or equally use intellectual blinkers to enable you to see what you want to see. Like Mr Parris I had never previously visited Clacton and my six hours pounding the streets yesterday in support of Giles Watling does not give me the knowledge or understanding to write judgementally of an entire community or imply they should be cast into the political wilderness. I clearly visited a different corner of Clacton than the one visited by Mr Parris. My roads were just like the roads I see every day in Tonbridge, Aylesford, Maidstone or any other corner of Britain. I suspect there are even roads like these in West Derbyshire, too. They are inhabited by decent, proud, hard working people who live by the rules, do the right thing and pay their fair share. They keep their gardens neat and tidy, hide their wheely bins around the side to keep the area looking respectable and I suspect look after their elderly or sick neighbours. They are fundamentally "our" people. But unlike Mr Parris I am not going to spend a few hours in an unknown town and judge everyone by the few I meet during one fleeting visit. Nor would I ever write off an entire demographic group and all the constituencies where they live, just because they don't quite suit my cosmopolitan world view. As Mr Parris knows (as he has written about it) political parties in Britain are by necessity a broad church. Our voting system requires us to have coalitions within parties and our winning coalition once included many of those who Mr Parris has derided. We shall struggle to form a majority until we win them back. I suspect much of his majority when he was an MP included the same people he now thinks we should abandon. But then again when it comes to abandoning his electorate in pursuit of self interest, Mr Parris has form. West Kent Towers organised a day at the seaside this weekend, with 35 activists on our coach to Clacton, and unlike our last last campaign trip to Eastbourne, this time I didn't leave anyone behind! It was a good day and what struck me most was the local morale. The circumstances of this by-election were "unfortunate" and we all know the early polls demonstrated a tough fight ahead, but the local members I spoke to were far from downhearted, in fact they were determined to fight all the way. One local campaigner told me, "I have worked for Douglas Carswell for eight years and have given more hours than I care to remember helping him on a personal and political level. A few weeks before his defection he sat on my sofa laughing and joking as we planned his campaign. At that time he must have known. I feel very used and cheated by a man I thought I could trust." Quite. 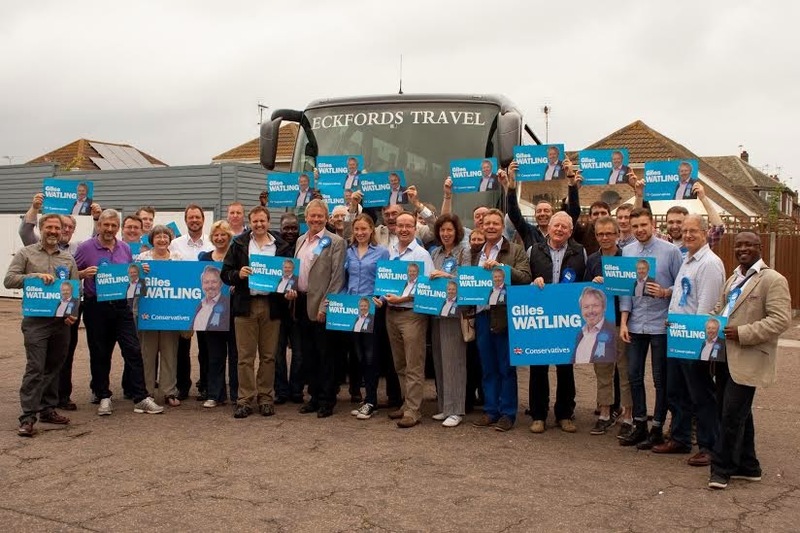 Our coach rendezvoused outside Clacton with Julian Walden and Marion Little (on her 55th Parliamentary by-election, what a legend that lady is!) Julian had kindly arranged for tea and coffee for the entire coach as we unloaded leaflets and received a briefing from Marion. After leafleting we all regrouped in a local seafront hotel for more refreshments and sandwiches, again kindly supplied by CCHQ, before heading out for canvassing. This hospitality was greatly appreciated by members, as was the effort made by the candidate and the Association Chairman to thank everyone personally for their help. If you have a spare day I strongly urge you to drive along the A11 and offer help. They're a great crowd and your support would be really appreciated. From a night of high drama in Scotland, a morning of high politics working with Tom Tugendhat to launch his own "Constitutional Consultation" in Tonbridge & Malling, a lunchtime spent arranging the Kent Area Conference and an series of afternoon meetings and conference calls to secure agreement for a very exciting project we will launch next week; it was "back to reality with a bump" to finish the day as we sent out 300 invitations to Chatham & Aylesford's Annual Horse Race Night, which I have compared for the last four years. 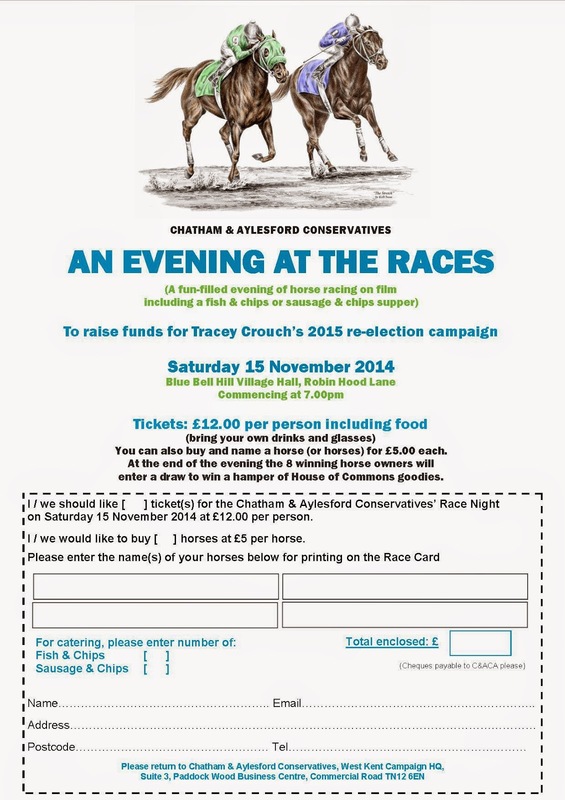 It's a great night and usually raises close to £2,000 for Tracey Crouch's campaign fund. And you get fish and chips, too! If you'd like to attend send me a message. Tomorrow, it's up at 5.30am to board the West Kent Clacton Omnibus. Took a call earlier from a friend who has just returned from a week campaigning in a target seat. "The trouble is Andrew if it wasn't for the gay boys we'd get no-one out campaigning!" Me: What about Steve Bell, he campaigns all the time and he's not gay. "Yes..... but he does live in Brighton." 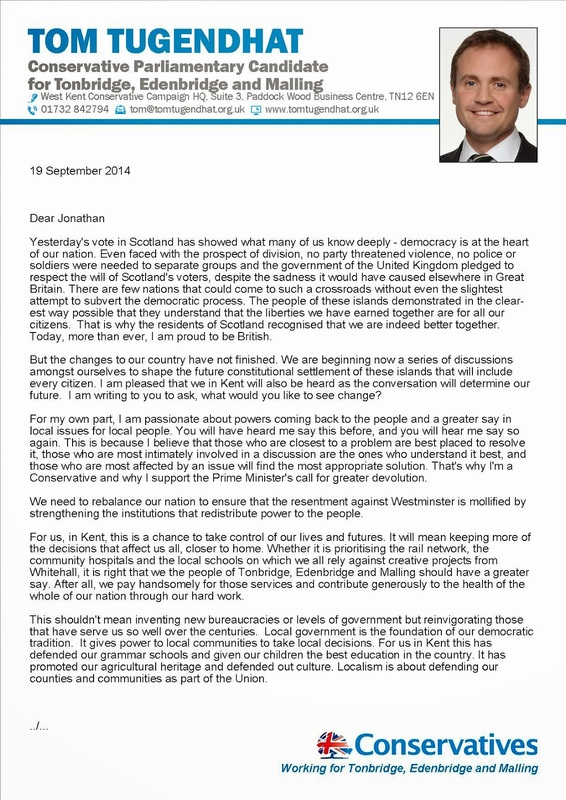 Tonbridge & Malling's Parliamentary Candidate Tom Tugendhat was quick off the mark this morning in circulating his response to the Scottish Independence Referendum and setting out the case for a wide-reaching review of the British constitutional settlement, inviting residents to share their own thoughts about future reform. The letter (below) was sent by email to around 3,000 local residents with a hard copy being sent to local businesses, community groups, schools and parish councils. This will be followed-up with a survey and perhaps culminating in a series of meetings around the constituency to engage residents in the discussion about any future reforms. I am delighted with this initiative from Tom as I have long believed that politicians at all levels should use their influence to promote political discussion and engagement. One of the best things coming out of the Scottish Independence Referendum was the 84.5% turnout; indicating that when the question is important and people feel passionate about both the issue and the value of their vote, they are still willing to turn out in record numbers and participate. New out today that Kent's Police and Crime Commissioner, Anne Barnes, is recruiting a Head of Communications. Part of the job role is to "Manage the PCCs public image and reputation". Don't get your hopes-up - I haven't resigned! And nor has Jon (at least he was still there when I called the office earlier). I had lunch today with a friend who has just been selected for a parliamentary seat. I don't wish to say which one, so let's just say "significantly north of Kent". It's not a 40/40 but it's certainly "in play" and my friend wants to give it his best shot. He is prepared to put some of his own money forward to secure the support of a good agent / organiser both to run his GE operation and to help ensure the already active Association receives the professional help and support it needs. This will be a fixed term job up to 7 May 2015, but longer if all goes to plan! I think he is looking at 20+ hours per week perhaps going to full time as polling day nears. He is prepared to pay a 'generous salary' (pro-rata) for an experienced campaigner with the key skills required for his campaign. By this he means understanding of Merlin, targeted Mosaic-based campaigning, direct mail and data building. I suspect the ideal candidate GE campaign experience and a knowledge of Merlin (not just how it works but how it should be used). Perhaps a retired agent who wants to smell the gunpowder one more time, or perhaps a 2010 campaign manager or similar. If you are interested, send me a message (in absolute confidence) using the 'contact me' box to the right. I will call you with a bit more info and if you are still interested I will pass your details on to the candidate. If you are going to Birmingham it would be an ideal opportunity to meet. However, please note I am not recruiting for this job or in any way involved in the campaign; I am simply using my blog to send out a message to all those who might be interested. Therefore please don't send me CVs or ask me about the details - that will be between you and the candidate. It's dark outside and we still have five candidates to interview! I am starting to get "local government cabin fever" as I provide support, advice, guidance as well as tea, coffee, biscuits (and occasionally sympathy) for the 18th Local Government Interview & Selection Meeting in the last four weeks. Tonight's meeting (TW Association this time) is the fifth in succession, including all day Sunday. Between the four Associations going through the process (with four different LG Committees) we have interviewed and approved (or not) over 150 new and incumbent candidates. There is light at the end of the tunnel. Tonight's session is the last of the "conveyor belt"
re-approval meetings with candidates appearing at 30 minute intervals. We now enter the "ward specific" selections; the overwhelming majority of which will be will be nem con. However I am currently putting in place procedures for "all member selection meetings" in several wards with in some cases up to nine applicants standing. 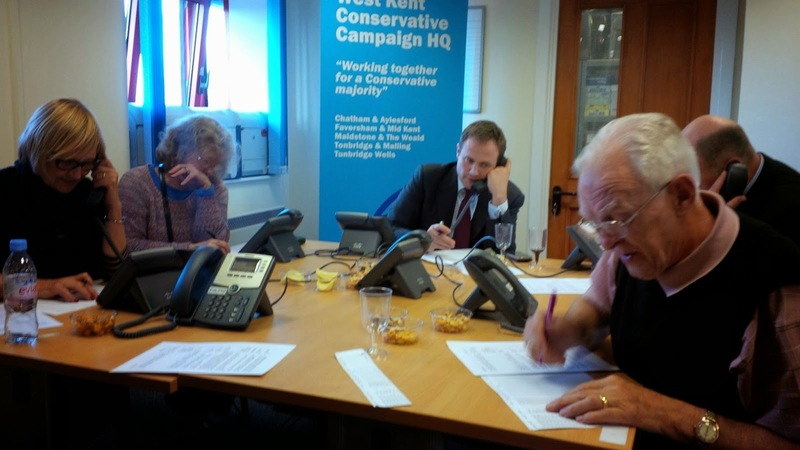 Yes - booking halls, sending out invitations and CVs and co-ordinating all the paperwork is time consuming and tedious, but what a joy to have keen, enthusiastic people jostling for position rather than having to scrape around on the eve of nomination day looking for unwilling volunteers. Well done to all our Local Government Committees (between them 35 members) who have given up their time voluntarily and spent long hot evenings sitting around tables talking about campaigning time-sheets, community involvement and council participation. It's a thankless and totally un-glamorous job but a vital part of the democratic process. And here is the Tunbridge Wells Local Government Committee in fine form tonight! 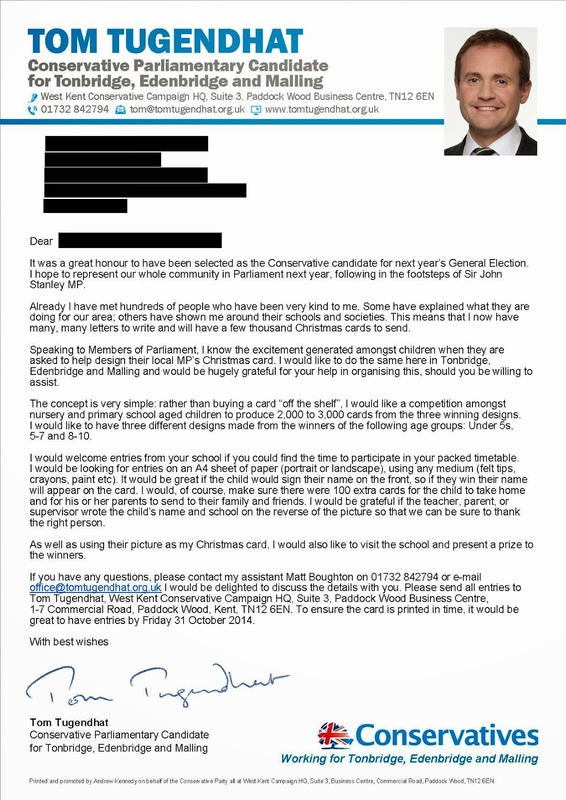 I appreciate that Tom Tugendhat is not the first Parliamentary candidate (or MP) to do this, but as this blog is a record of what we have done as well as a tool for sharing best practice, I thought it was worth recording and sharing. Earlier this week 90 local primary schools and nurseries received the attached letter inviting their pupils to send in a drawing / painting for Tom's 2014 Christmas card competition. There will be three winners (based on age : under 5s, 5-7 years and 8-10 years). Each winner will receive a prize from Tom and the child's parent / guardian will also receive 100 cards to send to their own family and friends. Our local printer has kindly agreed to print the cards free of charge in exchange for a small advert on the reverse. All in all, a super way to involve the community, harness the excitement and creativity of young people and spread goodwill - all at minimum cost. I look forward to publishing the winners' drawings in due course! 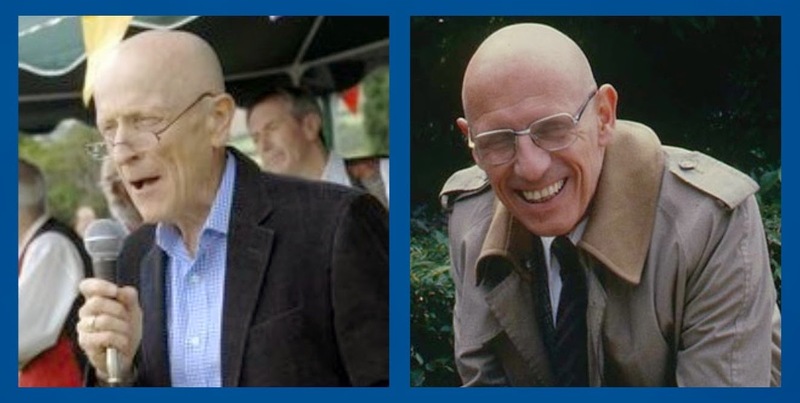 I am grateful to a regular reader who, having seen a photograph of Maidstone & The Weald Association Chairman Michel Foucalt on this blog emailed to ask if he and French philosopher / historian John Wilson had been "separated at birth". OK, I will accept your opprobrium as it's deserved but it's still a good blog story! I have just been watching the X Factor and up pops a bog standard boy band named "Overload", who won the hearts of the audience and the votes of the judges. Two lessons for us all. (i) Never say never. And (ii) beware what you say on the internet machine as it might come back and bite you on the bum! 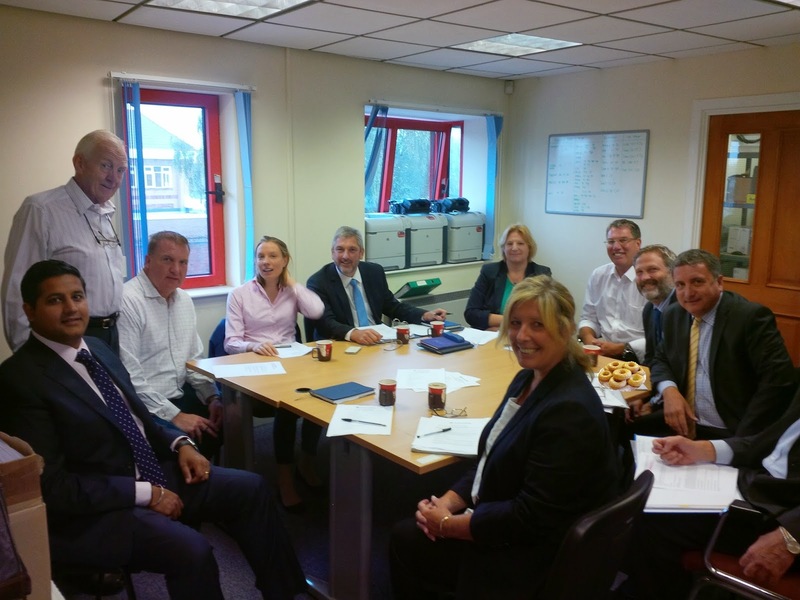 I am at West Kent Towers all day as one of our Associations are having a full day of Local Government Interviews. The first applicant is in the hot seat, I am in my office working on various projects, with half an ear on the events. His interview has gone through the usual set questions and the applicants is doing well. Then comes the blow..
along with the feather duster, appears to have gone missing." Despite being half Scottish (my father was from quite an established Lothian family) I have not posted any thoughts on next week's referendum. The reason is two-fold. Firstly, I am not quite sure what I think. And secondly I actually believe it's a matter for the people who live there, not for me. That's why I recoiled when I saw the Saltire being flown from London government buildings and blanched when well meaning English friends started writing to Scottish strangers encouraging them to vote no. I asked one (a prominent anti EU campaigner) if receiving a postcard from a stranger from Brussels might make him change his mind in any 2017 referendum! Every aspect of the debate leaves me divided. As a Libertarian I consider myself to be a political utilitarian. Yet I still have a love of tradition and only support change if the case for change has been proven. And that's the problem. At a recent event Rory Stewart, whose views on such matters are rooted in deep thought and good sense, spoke of the Union as two halves of a long established marriage which is facing difficulties. He said that both sides should surely try to find common ground upon which to build a reconcilliation and allow the marriage to survive. That of course is true, but can only work if both sides want to find common ground and if the common ground is sufficiently stable. What if one side feels the other is asking just too much? Or as is more likely in this case, the aggrieved party has changed so much over the years that what they have left in common just isn't enough to continue? Will Britain be diminished? Almost certainly yes, but equally many people believe Scotland would be enhanced. Throughout the world there are cases of larger countries believing they have been diminished by nationalist sentiment and succession - Russia and Ukraine or Spain and Gibraltar to name just two. That however does not give the larger country to dictate the terms of the relationship. Unlike the overwhelming majority of Conservatives I don't have an emotional attachment to the Union though I still believe there are political, security and economical advantages. But surely someone who passionately believes in setting the UK free from the so called social and economic union of the EU could not want to dictate that Scotland should not set itself free from the rest of the UK if it wants to do so? Whatever the outcome next week the result will almost certainly be very close. Unless the margin of defeat is substantial, it is almost inevitable that the issue won't rest and we will probably enter a period of "neverendum" with demands for a new vote following shortly on the heels of this one. And if I were a Scottish Nationalist I would be demanding that too. After all, the yes vote is solid. People who support yes have made a conscious decision to vote for change. The majority of the no vote are also people who have made a conscious decision to remain within the Union, but it also includes a sizable minority who probably dislike Alex Salmond, or who support Independence but fear the time is not yet right, or who have been swayed by fears of economic Armageddon. For example, if the UK government was not a coalition but actually a majority Conservative government following a more traditional free market Conservative agenda, would that alone not swing the additional 3% or 4% of the votes that the yes camp might be short? I suspect that change is inevitable; if not next week then sometime in the next ten or twenty years. Each wave of nationalism is quenched by more devolution and thanks to Gordon Brown and with the acquiescence of the three main UK leaders, even if Scotland votes no they will walk away with devo-max. What's left in the bank for next time? Already Scotland enjoys more funding, more devolution and far better public services than any other constituent part of the UK. That financial and democratic deficit has never been addressed and is allowed to continue only thanks to the munificence of English taxpayers. Thank goodness the English are less demanding than our Celtic neighbours. The question is, will they always be so? 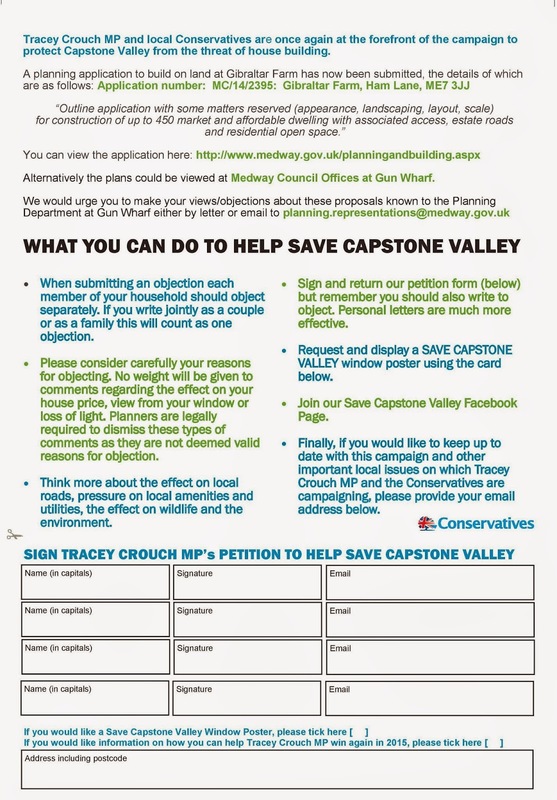 For almost 20 years Chatham & Aylesford Conservatives have led the campaign to save Capstone Valley from housing development. Capstone Valley and its Country Park is the last significant area of open space in the main Medway twons; a green lung which provides recreation and an oasis in one of the most heavily built areas on the South East. Now the developers are trying again, this time with a small scale application for just 1000 homes which, if agreed, will no doubt be a Trrojan Horse for bigger future applications which will then be almost impossible to oppose. Once again the local Conservative team are putting their money and their political clout behind the many non-political residents groups who are uniting to oppose this development. Tomorrow, 20,000 leaflets and petition forms will be delivered across Chatham. There are many unsung heroes in politics; but some are more unsung than others. Whatever stress and workload we are under, I never forget that I am paid. Councillors also work hard and certainly work more hours than their remuneration warrants. In Kent's rural councils the average backbench councillor probably receives (after tax) £60 a week for their efforts - or £3-£4 per hour. Half the minimum wage. However, there is a certain kudos in being an elected member including the municipal tie, leatherette document case and a badge with your name on it. Plus, most importantly, the ability to make a real difference to the community you serve. I don't want or intend to open a debate about who gives what and who is valued most as I have always held a view that everyone who contributes (by working, donating money or time or offering leadership) is making a personal sacrifice which they need not make. There are, however, a select group whose sacrifice and contribution is greater than I believe many acknowledge or understand. Our Association Chairmen. This poor chap leaves his home at 6am each day to arrive at his desk in the city before 8am. Works a full day, uses his lunch break to deal with Association emails, travels home at 6pm and more often than not goes straight fom the railway station to a local political event or meeting. In addition to the five meetings we had jointly attended he had also attended a local branch meeting, two branch social events and several meetings with members of his Management Team. Often three out of five evenings and most Saturdays are taken up by Conservative Party business. "It's voluntary - they don't have to do it." you might say. And you are right, they don't. But thank God they do. This particular chap (and many chairmen I know make similar personal sacrifices) probably has far better ways to spend his evenings than eating tuna pasta bake in a room full of stranger. "It would be nice to actually go home and eat a meal with my wife or find my family still awake". One Chairman I know well talked about the "awful trepidation" of the "serried ranks of poker faced harridans" at the AGM. 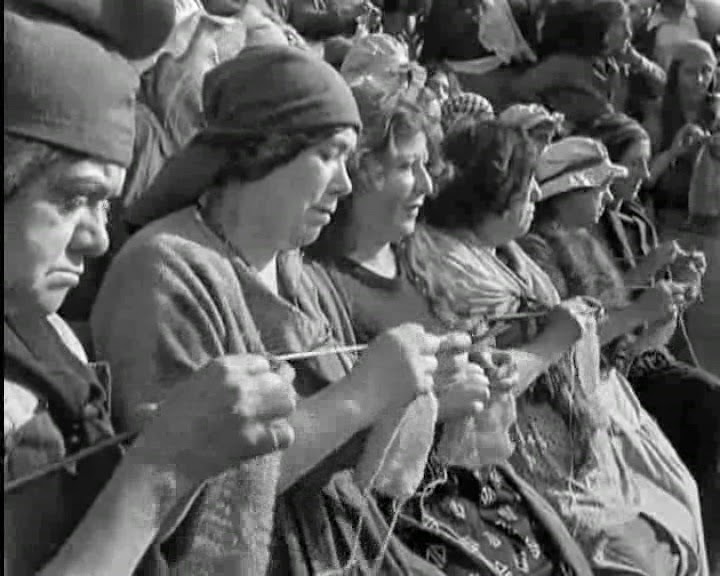 "Sitting in rows like suburban tricoteuse, sharpening their knitting needles and waiting to attack." What made it worse for this particular tormented soul was he didn't know the names of any of those asking difficult questions or raising points of order as, "despite attending 40 Saturday canvassing sessions and 80% of branch events over the previous 12 months, I had never seen or met any of them." Another Chairman I know has given 12 years to the voluntary party, as branch Chairman, co-opted Officer, DC Political, Treasurer and now Association Chairman. Like most, he has no political ambition of his own and doesn't need to raise his profile nor blow his trumpet. He makes the sacrifice simply as he believes in the Party and wants to do his bit to help. 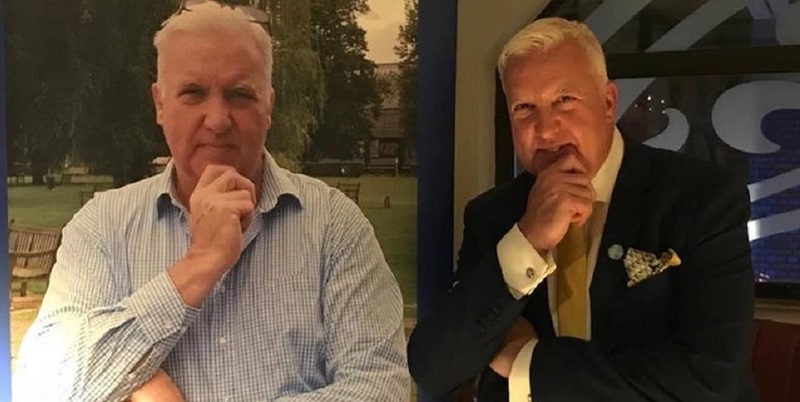 However when he moved house (half a mile outside the constituency boundary) he received a petition signed by 20+ members who "seldom lift a finger" decrying the fact that he was no longer local and should consider his position. Anyone with an area or regional role will visit an Association and spot immediately the quality of the local leadership; whether that Association is simply managing decline or whether it is led by someone with time, vision and commitment. The strength and quality of the senior Management Team is probably the biggest single factor between a failing and a thriving Association. So here is a vote of thanks to all our volunteers, but in particular to our Association Chairman for the amazing sacrifices they often make for no pay, no glory and too often not even a thank you. It's not been a good week for Chatham & Aylesford Labour. 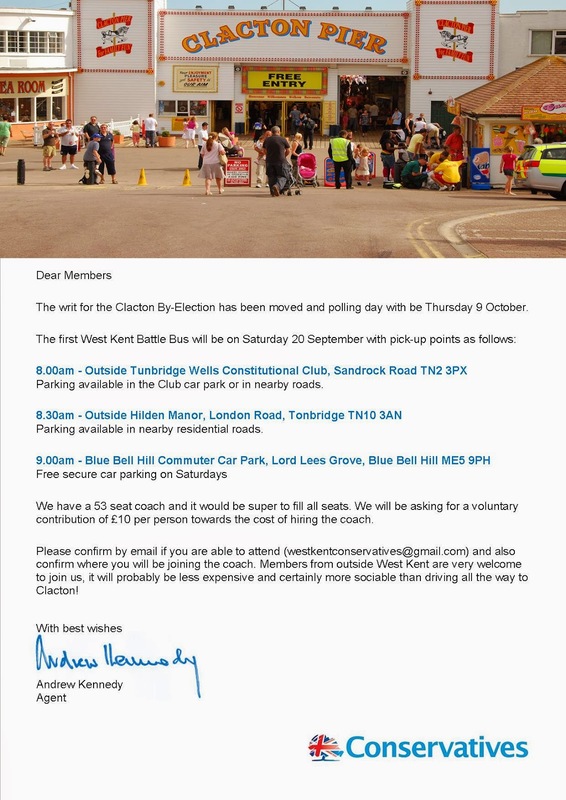 First we had "clash of the campaign launches" on Saturday - with both parties officially launching their campaigns in adjoining Chatham car parks. As previously blogged, Tracey had a team of over 30 - including many new helpers and lots of young activists out with her for the first time. I am not sure how many attended the Labour launch as no photographs or report has been published on Labour's website, but if it was the same gaggle of Comrades who we saw huddled around a clipboard at 11.30am in Highgrove Road, then C&A Labour really are in dire straits. Then today the Election Forecast website (run by academics from the London School of Economics, University of East Anglia and Durham University), published detailed findings that in Chatham & Aylesford Labour's predicted vote share is 2% down on last time with Tracey Crouch's predicted majority unchanged at 14%. They also predicted that based on polling trends and recent election statistics, Labour's chances of gaining Chatham & Aylesford is, wait for it, 1%. Could it get any more disheartening for the Comrades? Well actually, yes it could. If you drill down into the figures, it appears that Labour's chance of winning C&A is actually 0.6% - but they "rounded-up" the figure to 1% It must be quite a blow when you realise that your 1% chance of success is only achieved due to a statistical adjustment. Could it get worse.... Actually, I suspect it soon will. More to follow. The voters of Lewes have finally twigged! I am grateful to a blog reader from East Sussex for sending my a photograph taken on a doorstep in Lewes yesterday, confirming what most of us have known for years. 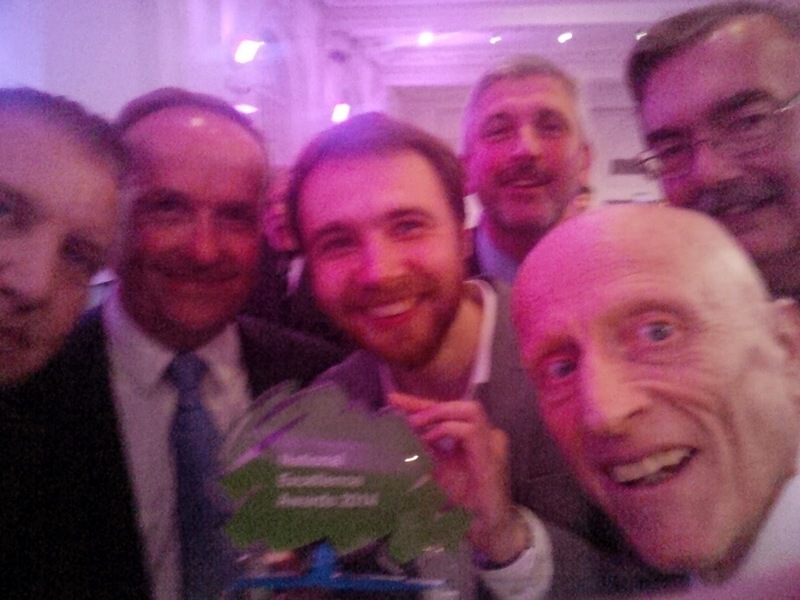 There's no denying it - I am a tad "chuffed" that the West Kent Group of Conservative Associations won the National Excellence Award for Campaign Support at the Conservative Party's Annual Award Ceremony in London tonight. 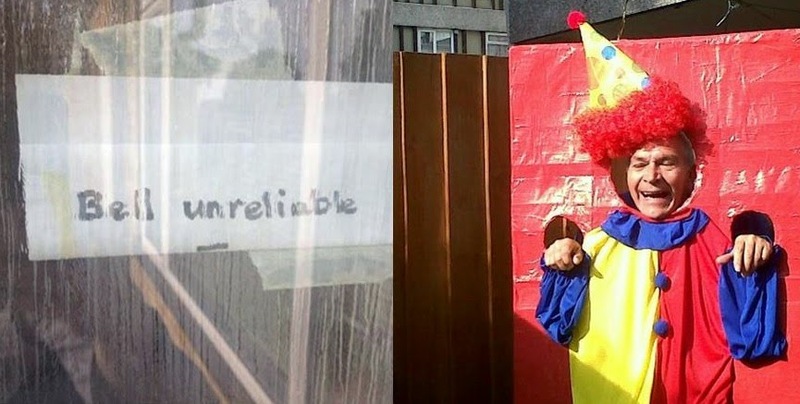 I am delighted for three reasons. Firstly no-one, however long in the tooth, can fail to appreciate having their work recognised. 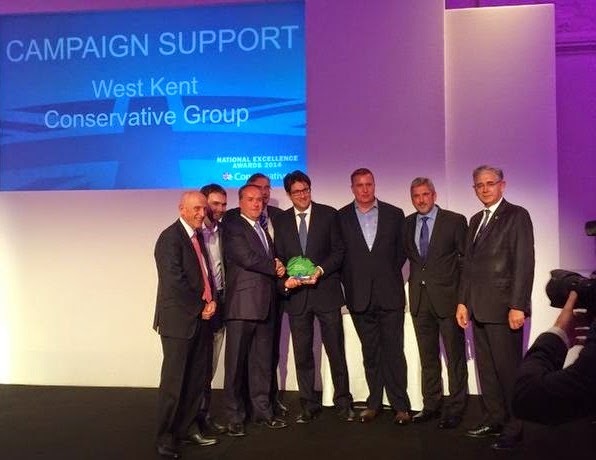 Secondly, the award was for "Campaign Support" and was given specifically in recognition of the work West Kent does for others. 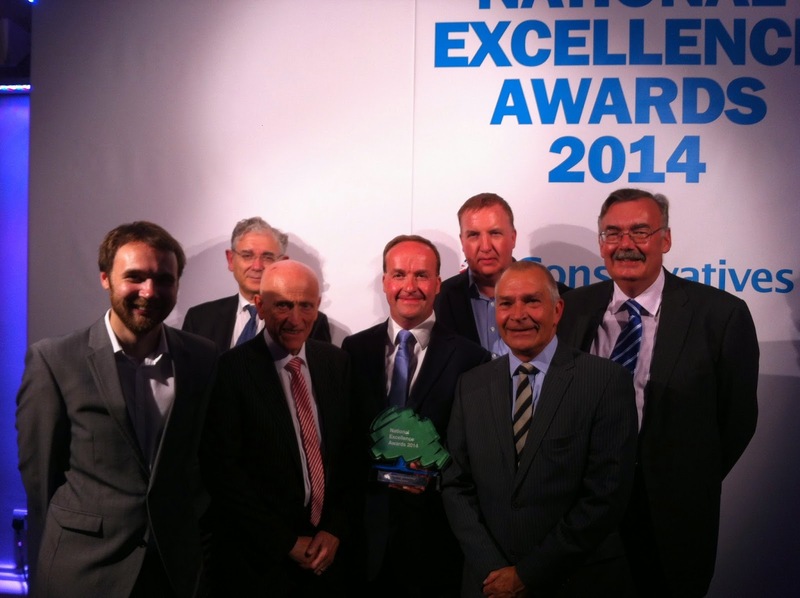 It was not an award for bringing five Associations together, for cutting overheads through grouping, for disposing of bricks and mortar or for streamlining administration. It was in recognition and acknowledgement that we did all of the above to enable us to share our resources for the benefit of the Party in the marginal seats which will decide the outcome of the next General Election. But most importantly of all, it was an award in recognition and thanks to a cast of hundreds; a small army of selfless activists who give day after day, night after night, weekend after weekend, manning phones, packing envelopes, knocking doors and tramping streets in constituencies they have never previously visited and on behalf of candidates they have never before met. A group who have no self interest other than a passionate belief that a majority Conservative Government offers the best hope for our country. So to William Rutherford and Jacques Arnold and John & Brenni Wilson and Gill Levine and Joyce Gadd and David Elliott and Bob Backhouse and Allan Sulllivan and Mike Franklin and Thelma Huggett and Matthew Dickins and Brian and Pat Moss and Bill Hills and Patrik Garten and Graham Riddick and Janet Sergison and Kathy Doody and John Balcombe and Judith Bullett and Sue Nuttall and David Wildey and Vivian Branson and Tashi Bhutia and Susan Potter and the Baldocks and the Streaters and the Gulvins - and many many others....this award is for you. The newly installed Kent Area Chairman, Andrew Mackness, is a good friend. In fact, Andrew, Nancy and I are sharing a narrow boat for Party Conference in Birmingham.There are, however, occasional "open goals' too tempting to let pass. Andrew emailed me tonight about the Kent Area Conference we are organising - and I was amused to see he had wasted no time in changing his email footer to reflect his exalted position. Unfortunately, something isn't quite right with the code, as underneath his name and his new very important job title (in fetching lime green) is the word "description"
OK, I'll get thee ball rolling.... Miserable, tight-fisted, yappy, Mancunian. Who was that chap standing behind Dave? 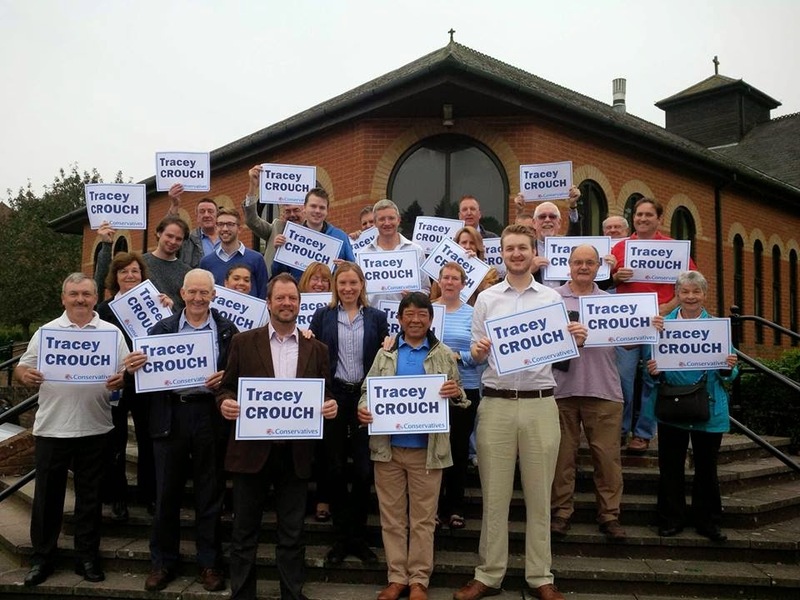 There was a palpable buzz at Tracey's campaign launch today with many new faces turning out for the first time. Many of the students who have completed work experience in either Tracey's office or the West Kent Campaign HQ came to help as well as new candidates and some of their families. It was super to meet and chat to so many new activists. Having spent twenty minutes shaking hands and introducing myself to new people we, split into 10 groups to cover more ground' teaming-up experienced campaigners with new ones. As Tracey and I walked towards our rendezvous I asked her, "who was that chap standing behind Dave...?" She had no idea, "I thought he was with you". We both stared at his photo on my phone - completely flummoxed. "I met him and introduced myself, and he seemed very keen", I said. The mystery deepened when neither the local Chairman nor the Voter ID Co-ordinator knew who he was either. Finally the mystery was resolved. The poor chap had come along to the local councilllor's advice centre being held in the church hall where we met. Being a fan of Tracey Crouch he came over to say hello, whereupon he was accosted by me, thanked enthusiastically for coming and given a poster to hold for the team photo. And here's the best bit... He had such a nice time he has now joined the Conservative Party and is coming out to help again! re-election campaign. We visited over 2,000 houses and found hundreds of new pledges. 2. Tracey Crouch was significantly out-polling the Conservative Party by a very significant margin - a statistic indicated in each of our recent constituency polls. Labour Party is not functioning in any capacity." A full day of campaigning and selections tomorrow, commencing with a campaign launch in the morning followed by a full day of Local Government Selection Interviews at West Kent Towers The Tonbridge & Malling Local Government Committee are interviewing 12 new candidates to join the Approved List. Coming up for "interview and approval" tomorrow is the first tranche of our "bright young things"; our 20 - 30 year old new applicants who I hope will refresh the pool of talent and ambition for the years ahead. I was therefore a tad concerned when a post from one of our "bright young things"appeared on my Facebook time line. I hope he doesn't turn up breathing fag and Jagermeister fumes over our selection panel! It was with great sadness that Kent Area Management Executive accepted the resignation of Chairman Alex King MBE at its meeting today. Alex has had problems with his feet for many years and has recently been told that he might need an operation. Realising this might impede his campaigning abilities in a General Election year, Alex honourably offered to stand down. The new Chairman, elected unanimously at today's meeting, is Andrew Mackness. In his acceptance speech an emotional Cllr Mackness said, "I have learnt a great deal from Alex and look forward to continuing his conciliatory and emollient style of leadership as we approach the General Election in 2015." Julie Marson and (out of picture) Graham Gibbens. "Keep your knees together, Girl!" Well, after months of planning, it finally happened. West Kent's "COMING UP TRUMPS - AN EVENING WITH BARONESS TRUMPINGTON" was staged with great success at Maidstone's Hazlitt Theatre tonight. 200 local members and activists came along and enjoyed a superb performance from this magnificent lady. From her opening line, "keep your knees together, girl" to her final exit two hours later (having dedicated and signed 60 copies of her biography) she enchanted the audience with tales from her remarkable life. It was all I expected it to be - and more; resulting in a well deserved standing ovation at the end. I am afraid the video file was too big to upload to YouTube in one hit - so it's in two sections. The first video covers probably 90% of the show, with the final 10% on clip two. My thanks as always to Jon Botten and Matt Boughton, who work tirelessly with me to make these things happen. To our West Kent Chairman, William Rutherford, for his superb introduction and hosting (including a very kind and generous tribute to me). 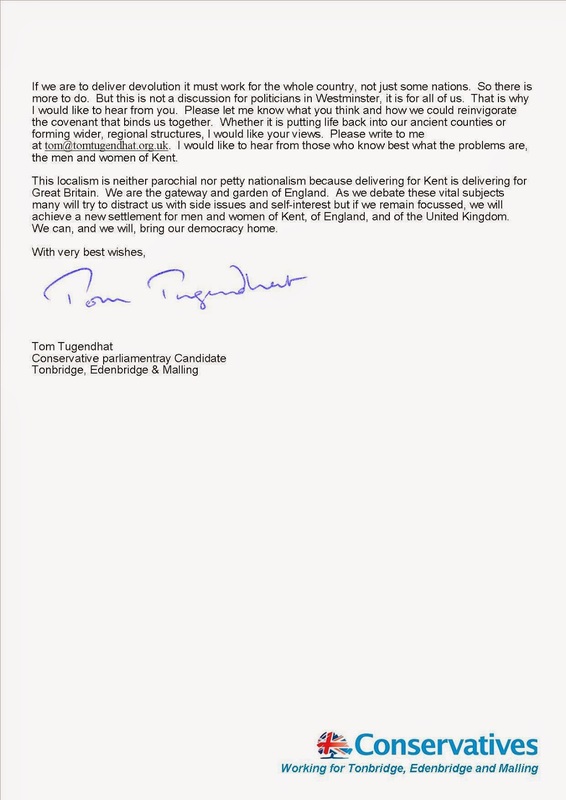 To Tonbridge & Malling's Parliamentary Candidate, Tom Tugendhat (for providing transport for Baroness Trumpinton to and from her home in Battersea and for conducting the on stage interview). To Joyce Gadd, Sue Nuttall, Vivian Branson and Thelma Huggett for selling the raffle tickets. To Chris Baldock who assisted me selling Baroness Trumpington's auto-biography at the end of the show. To Sophie Shrubsole for obtaining the books at cost price from the publisher, and to the management and staff at the Hazlitt Theatre for providing so much assistance and technical support. And, of course, to our members whose support makes it all possible. I am sure when their somewhat eccentric Agent suggests we "hire a theatre and put on a show" they must roll their eyes and think "Oh God, what's he planning now...?" But regardless, they never stint in their support and encouragement. And here is the second short installment - but please watch just the first 5 minutes as I accidentally left the camera running. If you keep watching you will have to sit through the raffle and the slightly disturbing sound of 400 arthritic hips and knees clicking as the audience leaves the theatre. Basically, your troll is a deluded wazzock. (b) highlights some of the problems we, as a party, still need to address. I have reproduced this with the writer's permission, having removed any references to his name or the Associations referred to. I am grateful to the writer for his kind words and consideration. Regarding your blog about West Kent's support of marginals - as far as I can see, you are the only "safe" Tory area doing anything similar. (Constituency A). I met the Chairman at a function for 40/40 seats and potential benefactor constituencies. I quickly established that they have loads of members, a lot of councillors/safe council, an MP with a big 5-figure majority and by his own admission no real campaign targets in their patch. They've been asked to help with a nearby marginal (20 mins away), but it became apparent that they haven't given any actual support ("I suppose we ought to really, but..."). Instead I heard a long tale of woe about the impossibility of finding new council candidates to replace the over-mighty and lazy incumbents, the inability of the chairman to challenge the selection of these councillors because there are no alternative candidates available, and how all this makes it impossible to rally troops or really do much of anything because, you know, it's all just such an uphill battle. I asked what he'd done to recruit new councillors, mentioning some of your ideas and things we'd tried...tumbleweed rolled past. Constituency B. This was supposed to provide help for (name of correspondent's constituency), but I don't think we heard anything from them. At the time we assumed that for some reason they took a dislike to us and/or went elsewhere, plus there was some story that they were worried their new candidate might not win (15k majority...). Well, one of our main activists moved to that area a couple of years ago and is now travelling back 1 day per week to help in because there's just nothing going on there. They didn't have Merlin. He's got them up and running on it, but they seem to have lost interest because it requires data to be put in first. They don't canvass. He tried to set up a delivery network, but no one could really see the point. For all their members and funds, they appear to have no effective campaign strength or expertise. I have also heard via a couple of sources that a number of the 'big' (nearby rural county) seats are in dire financial straits because they spend so much money on an old building, and staffing it. In total there must be many tens of thousands of pounds every year which could be funnelled into campaign funds in marginal seats. No wonder we haven't won an election for 22 years...sometimes I wonder that we ever won! On the bright side, we have had support from a number of constituencies, nearby (name) and (name) for instance are quite active on our behalf and (name of MP) was here this weekend in fact. Even so, what you do with mentoring, helping to build capacity and spread good ideas personally and via your blog goes far beyond simply turning out out with a team of activists, which itself is vastly more than what many "strong" Tory associations are doing. Basically, your troll is a deluded wazzock. But you knew that. 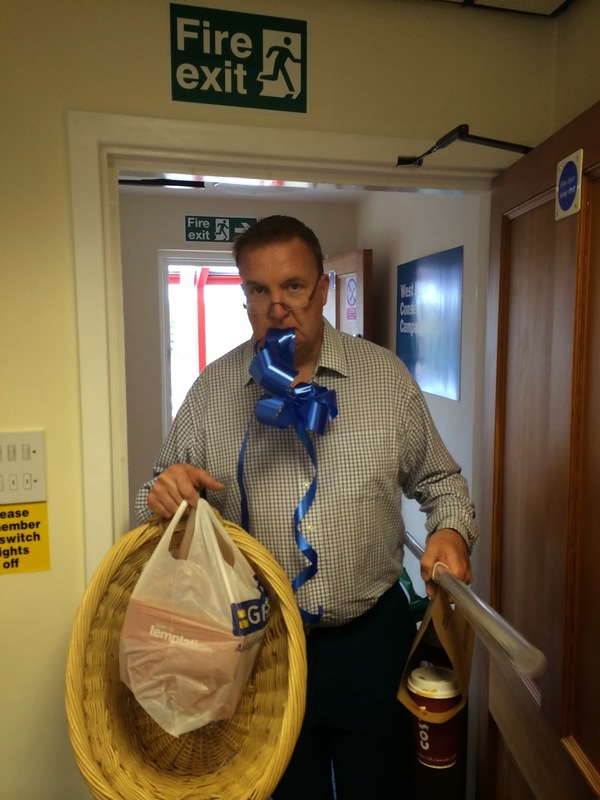 Warning - never let the campaign intern spot you through the window laden with raffle detritus as he will have a camera at the ready to capture the moment as you walk through the door. Every few weeks for over a year now, a kindly and generously natured soul has posted an anonymous comment on my blog criticising West Kent for the level of campaign activity locally and suggesting we are doing the party a disservice but not doing more for our marginal constituencies. Sometimes I publish his comments. Sometimes I delete them. I would be far more inclined to engage if the writer had the courage to put his name where his mouth is! Now what our local members know, which Mr Anonymous doesn't, is West Kent probably do as much if not more than most to support our 40/40 Campaign. However, because much of what we do is political significant, we don't shout it from the rooftops (nor do I feature it on my blog). So, for the sake of Mr Anonymous, here is a sample. 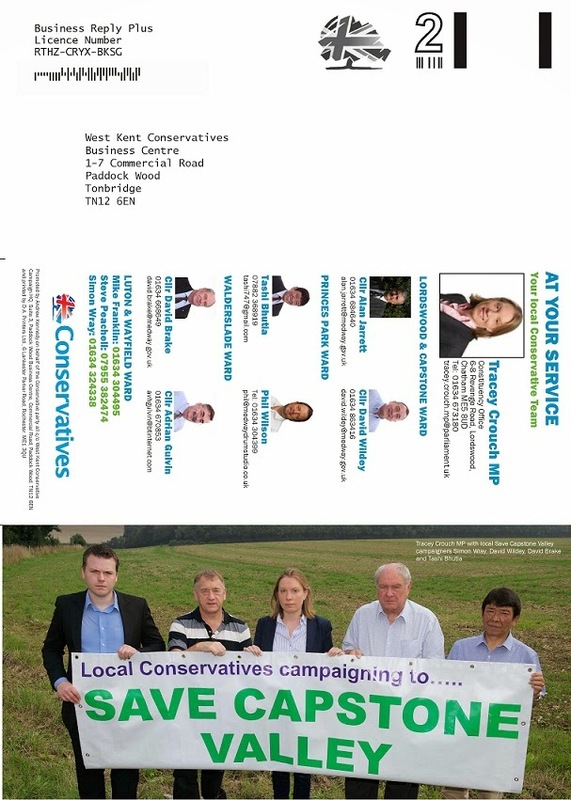 Some of the following actions arise from individual one-to-one campaign support from West Kent Associations to twinned constituencies, other examples come from the West Kent Group as a whole. Paid for a coach to take activists Eastbourne. Further coaches planned this year to Hastings and one other seat (which I won't name). £2,000 in coach hire charges. 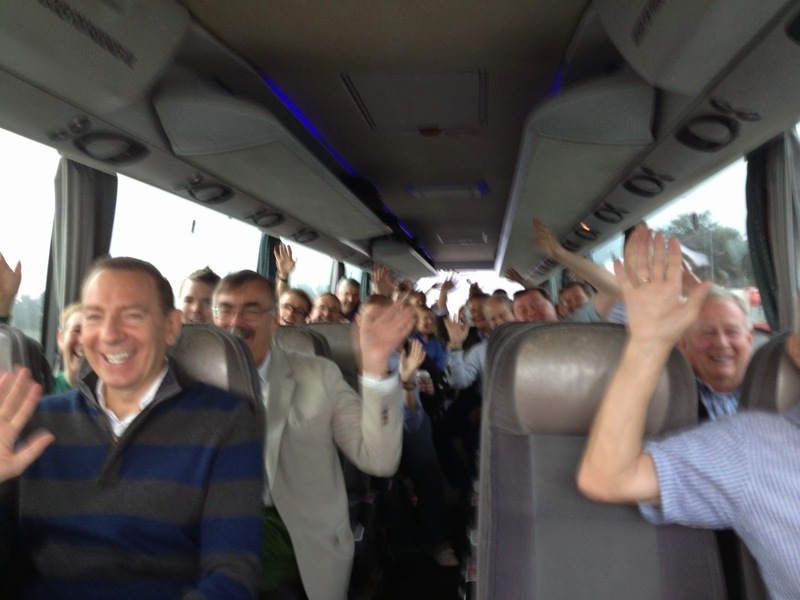 Paid for a coach to take activists to Eastleigh and Newark. Since Christmas West Kent has subsidised my salary to the tune of £4,000 whilst I travelled to 40/40 and other marginal seats to provide Merlin and general campaign support for their staff and volunteers. Much if what we do is not quantifiable, and there are other examples which are so specific I cannot blog about them at all, but taken together (salary, time, print, phone calls, mailing, stationery and cash support) I estimate that West Kent and its individual Associations channel around £20,000 to marginal and 40/40 target seats. I really don't know who you are Mr Anonymous, or why you are so angry. Despite your sarcasm I am a forgiving and cheerful soul. If there is anything we can do to assist your constituency, please get in touch and I will raise it with our Management Committee and see what we can do - provided you are able to demonstrate that you are at least trying to help yourselves. Plenty of space for friends and colleagues from across Kent and Sussex. Email westkentconservatives@gmail.com to book your seat. We are fortunate to have a small army of helpers at our disposal, who never fail to rise to whatever challenge. Two members, however, are "always there" when called on, and today really did go above and beyond the call of duty. Tonbridge & Malling stalwarts Owen and Chris Baldock arrived at West Kent Towers at 10am this morning and were still there when I left just before 6pm tonight. 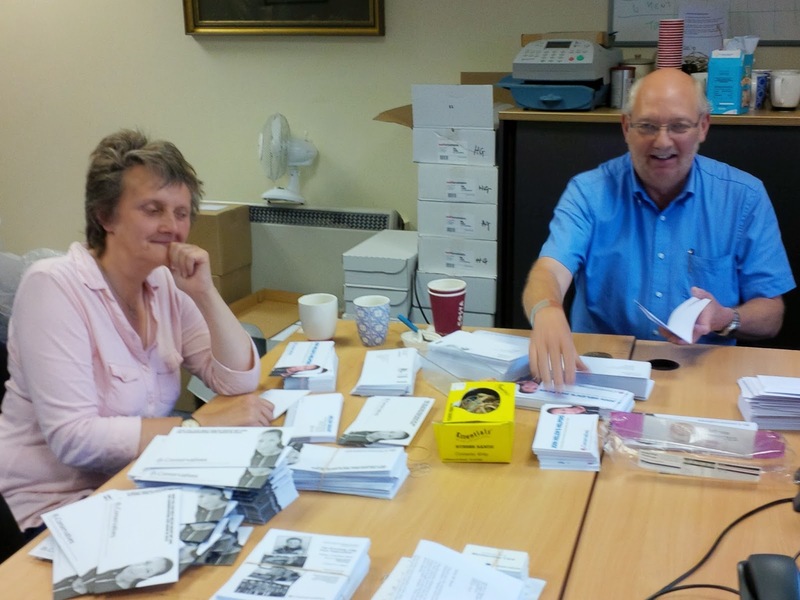 Apart from a brief 30 minute lunch break, they worked non-stop and packed over 2,000 envelopes. What's more impressive; the work they were doing was not for their ward nor even their home constituency. It was for Helen Grant MP in neighbouring Maidstone and the Weald. One of the reasons we receive so much willing help is our volunteers know their efforts are appreciate. For example, the team who came in last week to assist with Maidstone's packing each received a personal note today from Helen Grant thanking them for their efforts. A nice touch, too often overlooked. 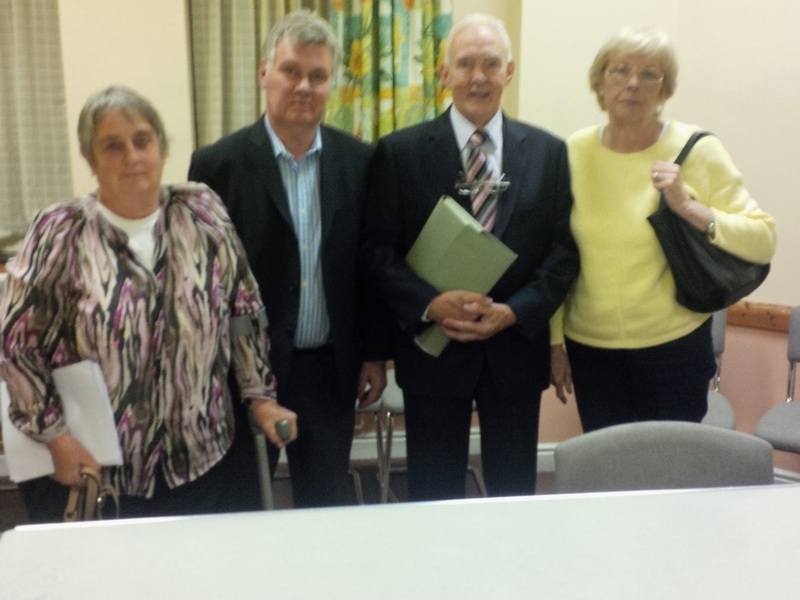 Some of the weary members of Chatham & Aylesford's Local Government Committee at the end of tonight's meeting to finalise selections for next year's local elections in the Chatham wards. This was the third and final round of the contest, with applicants having gone through an assessment evening, then one to one interviews to join the "approved list" and tonight the final round of contested ward-by-ward selections. Nearly fifteen new candidates have come forward for selection in C&A this year. Tonight's meeting saw contests for two seats - each with five outstanding applicants. My thanks to all the volunteers who have given up many evenings assessing, interviewing and selecting our next generation of candidates and councillors.And thanks too to our candidates, many of whom have never been involved in politics but who put in amazing performances at the various stages of the selection process. 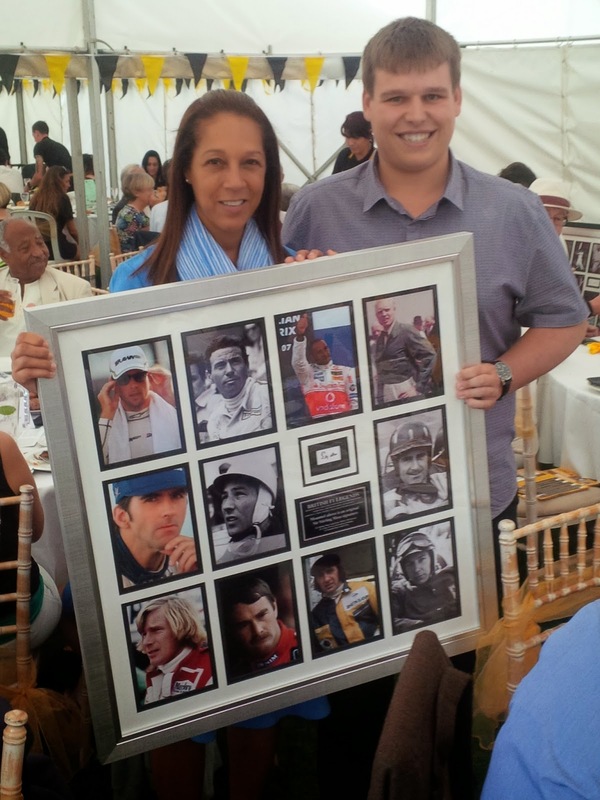 Our star intern Matt Boughton won a super prize at a charity cricket match yesterday - a large montage a Formula 1 photographs in a display frame - signed by Sir Stirling Moss. Matt, who apparently has little interest in F1 has kindly agreed to auction this and donate the proceeds to West Kent funds to aid our target seat campaign. I suspect there is also some parental pressure along the lines of "this isn't going up in my house - stick it in the garage." The value of these things is hard to determine, but by way of example Matt has already been offered £120. If Matt receives any offers over £250 by next Monday (8th September) he will sell it to the highest £250+ bidder. If £250 has not been reached, he will list it on Ebay.